The train was on time and had started at London Liverpool Street. It was a four car EMU with about twenty passengers on board. 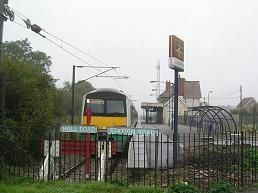 After leaving the built up area of Wickford, a small commuter town for London and Southend, the train moves into open country, which is flat, and mainly scrub until we come to the first station at Battlesbridge. The village is famous for its Antiques Centre, housed mainly in an old granary. The train then follows the northern bank of the River Crouch until it comes to Woodham Ferrers a "new town" aka South Woodham Ferrers. The station is situated to the north of the new town and has quit a large car park for commuters with the usual bus stop waiting area. We continue along the track with the land being slightly more hilly to the north of the line and full of sheep grazing, until we come to Fambridge, where the up train to London is waiting on the other track. Fambridge has an old hall, which can be seen to the south of the track. Next stop is Althorne, which is a tiny country station. The car park has spaces, an indication of the sparseness of its population. By now the River Crouch is getting ever wider and lots of masts of sailing boats can be seen as we approach Burnham-on-Crouch, a small town well known locally for its sailing. The station looks old and judging by the large car park, probably had a large siding in days gone by. Several people alight here before the track turns north and onto Southminster. To the right of the line soon after Burnham is Mangapps Railway Museum built on a farm with 3/4 mile of track. 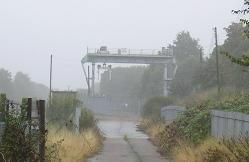 At Southminster there are some sidings with a large crane, which is used to lift nuclear flasks from nearby Bradwell Nuclear power station, onto the freight trains, which use the line at night. The station is completely deserted with just a ticket machine, but no sign of life. The track ends with the road being just beyond the buffers. There is plenty of new housing surrounding the station, built presumably to cash in on the potential commuter market, but the actual village of Southminster could be described as a large village, population approx 3,000. It has two pubs, a post office, estate agents, Indian and Chinese takeaway, a church and not much else.